Even though Sgt. Clint Underhill is stationed a half a world away in Afghanistan, he was still able to deliver a wonderful Christmas marriage proposal to the love of his life, Kimberly Roberts, with a little help from Old St. Nick. Roberts’ parents, who were in on the surprise, had a bit of trouble coaxing their daughter to visit Santa at the Eastland Mall in Evansville, Ind. But, once she was safely on Santa’s giant-size green chair, she revealed that her Christmas wish was for her boyfriend to return home safely from Afghanistan. 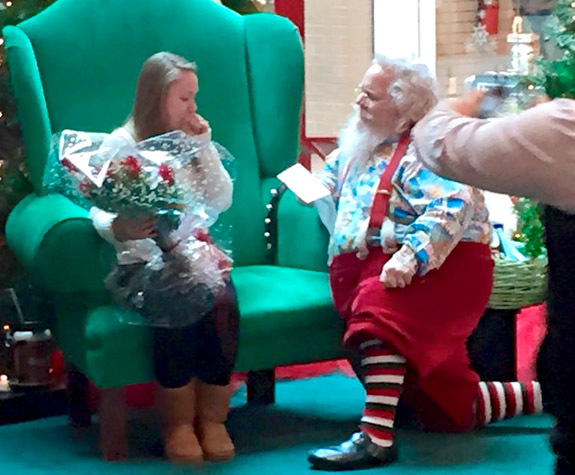 With an audience of holiday shoppers watching in amazement, Santa handed Roberts a large bouquet of red roses. Then he dropped to one knee and read the words penned by the romantic soldier. 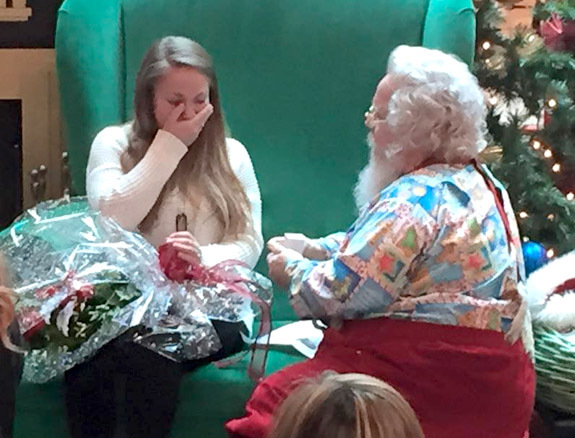 Acting as Underhill’s surrogate, Santa asked Roberts for her hand in marriage. She accepted the ring, said "Yes," and the mall patrons screamed with delight. Despite the countless requests Santa has heard through the years, he told CNN that this was the first time he was asked to deliver a long-distance marriage proposal. Sgt. Underhill told CNN that he wanted to give Roberts the proposal she wanted. "I talked with her mom, and that's pretty much how it all started," he said. Roberts was thrilled with the surprise. “Definitely the best present I could ever ask for," she told CNN. "I'm so excited." The young woman did have a bit of explaining to do when her nieces didn’t quite grasp the fact that Santa was acting on behalf of her fiancé. "[They] thought I was going to be Mrs. Claus when they saw the video, so it was definitely amazing," she said. Sgt. 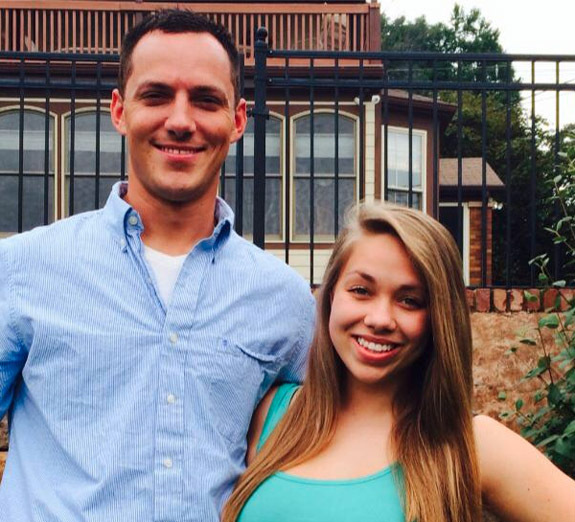 Underhill is scheduled to return from Afghanistan in June. Although the couple has yet to set a date for the wedding, it is certain that Santa will get an invitation to the big event. "Are they going to have cookies along with the cake?" the witty Santa asked a reporter from CNN.